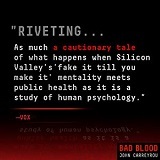 For anyone with even a passing interest in executive communications in Silicon Valley, Bad Blood is a must read. Wall Street Journal investigative reporter John Carreyrou delivers a step-by-step history of Theranos, a Silicon Valley startup headed by the young, charismatic founder and Stanford drop-out Elizabeth Holmes. He has written a masterful, suspenseful tale of allegedly illegal acts that range from intrigue and deception to outright lying and fraud. Elizabeth Holmes, who imitated Steve Jobs in both dress, abrasive management style, secrecy that verged on paranoia and, most tellingly, presentation skills that created a “reality distortion field” among her audiences, was able to raise hundreds of millions in venture funding and the support of an incredible cast of characters including Henry Kissinger, George Schultz, Rupert Murdoch, James “Mad Dog” Mattis, Larry Ellison, Mark Andreesen, Chelsea Clinton and the head of Stanford’s chemical engineering department Channing Robertson. What seems almost unbelievable, in hindsight, is that every one of these eminent leaders supported Holmes even as doubts were being raised about the technology by a number of ex-employees and regulatory agencies. Most poignantly, Secretary of State George Schultz chose to believe Holmes over the pleas of his own grandson who had worked at the company and had serious concerns. Theranos was founded on technology that promised vital health information could be gleaned from a small drop of blood using handheld devices supposedly equal in accuracy to the those depending on the much larger quantities of blood drawn by companies like Quest Diagnostics and Laboratory Corporation of America. This was, apparently, never the case. The company was adept at hiding its failings from those who doubted their claims. Theranos ran under a strict code of secrecy. Management created smoke screens and diversions. Investors kept pouring in money, turning Elizabeth Holmes into a temporary billionaire. Companies like Walgreens and Safeway struck deals with Theranos. The press lionized the charismatic Holmes. Despite the aggressive tactics of the best lawyers money could buy, including the super-scary David Boies, Carreyrou’s investigative work shone light on the deception. The final third of the book is his story and the revelations that started with the October 15, 2015 front page story in the Journal. For those working in Silicon Valley this is a cautionary tale. Take note of what your moral compass is telling you. Elizabeth Holmes left Stanford University’s School of Engineering in 2003 to build Theranos. Under Holmes’ leadership and vision, Theranos is developing technological innovations that will enable access to the information patients need to take control of their health, with the goal of detecting diseases in time to affect outcomes. Theranos pioneered affordable, transparent pricing for lab tests, and in 2015, Holmes worked with leaders in Arizona to pass a law that expressly recognizes individuals’ right to directly access laboratory tests without first obtaining a requisition, which often requires insurance eligibility. Holmes is a named inventor on over 200 patents (U.S. and international) that are foundational for the company’s more than 1,000 pending and issued patents, many related to less-invasive lab testing on smaller samples. Dr. Channing Robertson is the Ruth G. and William K. Bowes Professor (Emeritus) in the School of Engineering, Stanford University. He served as chairman of the Department of Chemical Engineering and as senior associate dean for Faculty and Academic Affairs in the School of Engineering. He is a Founding Fellow of the American Institute for Medical and Biological Engineering. There’s also pictures of the miniLab & Nanotainer with the disclaimer “This technology has not been cleared or approved by the FDA and is not for sale in the United States.” Fair enough, then. I guess the endgame is here for Theranos. Wonder what the last guy out the door will do?